I’m behind in sharing recipes and now summer is practically gone, but maybe it’s still hot where you live. Maybe you want something a little bright to bring some sunshine to cooler Fall days. Maybe you want to make this cake. This cake is a kuchen, prounced “koo-ken” best I can tell. Kuchen is German for cake. I’m not German and I’ve never even eaten kuchen before, but this recipe looked so good I had to try it. I’m so glad I did. 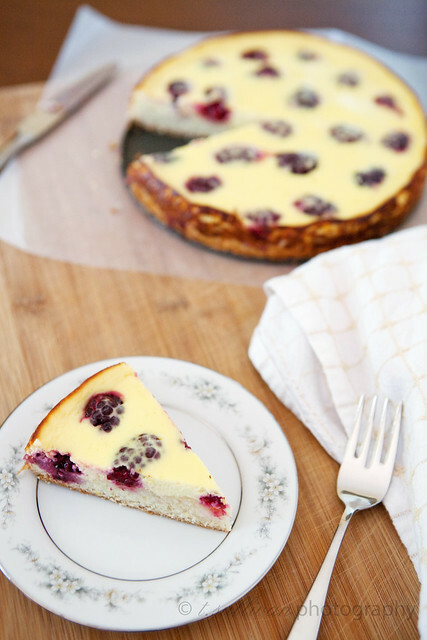 There are several varieties of kuchen. This one has a base cake layer that is dense like a pound cake. The top layer is a smooth, creamy, almost cheesecake-like layer of custard. It’s fantastic! While this recipe is probably best made at the peak of summer, when fresh summer berries are bursting with ripeness, it can be made with frozen berries which means it’s suitable for any time of year. It uses my beloved Greek yogurt, which I think qualifies this cake as a breakfast food, but it’s equally good as a snack or for dessert. It’s simple and unfussy, but yields beautiful results. Best of all, with only 4 Tablespoons of butter in the whole thing, it’s practically health food! In short, I loved it so much I told everyone I know about it, immediately made a second kuchen, and forced my friends to eat it. This cake is equally great with raspberries, so feel to use them if you prefer. If using frozen berries, thaw at room temperature and drain excess liquid. Preheat oven to 350°F. Spray a 9-inch springform pan with baker’s spray. In a medium bowl, whisk together flour, sugar, salt and baking powder. Add melted butter, egg whites, lemon zest, optional milk and vanilla. Stir until a soft cookie-like dough forms. Press dough lightly into bottom of prepared pan. Set aside. In a large bowl, whisk together yogurt, sugar, egg yolks, egg, zest, lemon juice and vanilla extract until smooth. Let sit for 5 minutes. 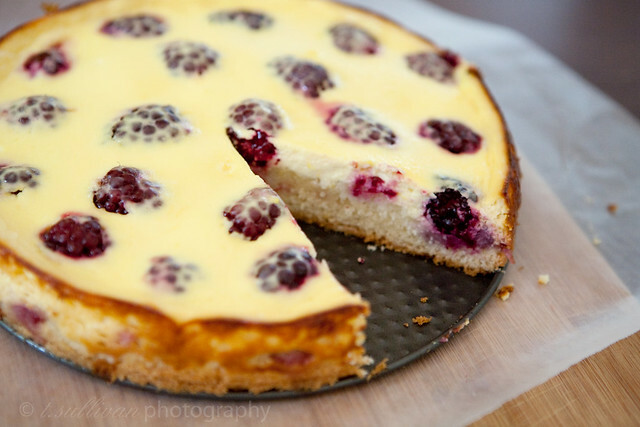 Spread berries evenly on top of dough. Pour yogurt mixture over berries. Bake at 350°F for 45-55 minutes, or until center is set but still jiggles when gently shaken. Cool in pan for 15 minutes. Remove outer ring and cool about an hour. Cover and chill for 4 hours, or until ready to serve. Ah yours is beautiful! I loved this cake and really need to make it again with fresh berries so it can be even prettier. Glad you enjoyed it as much as I did XD. Haha I like the sound of cake-infused health food. Sounds perfect to me! I’ve never seen a cake like this before, it looks really good (and so pretty!). The custard-y top layer sounds interesting and I love that the recipe is pretty light. I will definitely be trying this!